London goes wild over Israel’s band of disabled musicians. For the first time ever, Shalva Band has gone international. This singular band, composed of eight Israeli musicians with physical and mental disabilities, inspired thousands around the world after their video clip went viral. Since then, they embarked on a world tour, appearing at dignitary and cultural events in cities spanning three continents, including London, New York, Toronto and Mexico. The Shalva Band’s appearance last night at the British Friends of Shalva benefit dinner in the Montcalm Hotel in March Able was a smashing success, moving the audience to tears. Shalva, the Israel Association for the Care and Inclusion of Persons with Disabilities, was founded in 1990 by Kalman and Malki Samuels following their personal experiences raising their son Yossi, who was rendered both blind and deaf due to an injury that occurred during infancy. Today the organization serves 2,000 children with disabilities and their families through a variety of therapy, educational, and recreational programs and services ranging from infancy to adulthood and also supports and enables families to raise their children with disabilities within the family framework. Shalva National Center in Jerusalem is the largest and most advanced center for disability care and inclusion in Israel and the world. This year’s British Friends of Shalva Gala Dinner in the majestic five-star luxury Montcalm in March Able in Central London was attended by some 300 guests. Dinner chairs were Ingrid and Simon Sterling who are proud supporters of the organization. 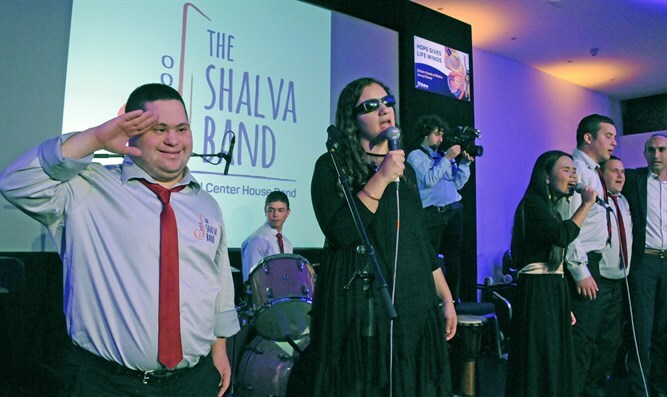 The feature event was, naturally, the Shalva Band, composed of its eight adults with disabilities including Down’s syndrome, autism, and various physical handicaps. Guests could not get enough of the delightful Shalva Band and whilst many were moved to tears, all were on their feet dancing as the band played a combination of Israeli pop songs and a special performance of Here Comes the Sun, which was prepared specifically for their UK audiences. The dinner raised £350,000 to benefit Shalva. In Israel, Shalva band performs several times a week, often alongside music celebrities. They recently released their first album which was an instant smash-hit. Shalva Band director Shai Ben-Shushan shares how his band formed, “When Shalva Band started over ten years ago, it was merely an expansion of Shalva's music therapy program. Today, Shalva Band has become an international icon for inclusion. We’re a real-life example of the amazing things that can happen when you empower people and their abilities and believe in their potential. This is a message that everyone can relate to, whether or not they have disabilities." Band rehearsals focus on qualities beyond perfecting their impressive musical repertoire, including honing fine motor skills, discipline, and refining social and communication skills. In preparation for their world tour, Shalva Band prepared special musical renditions in English. For some members of the Shalva Band, international travel and even the plane ride are firsts, as are the experiencing of leaving their families and contending with unfamiliar cultures and languages. To support them through the challenges, they are accompanied by a music therapist and social worker, two members of the band’s extensive support staff. On the other hand, for all Shalva Band members, the performance in a five-star hotel in England is a dream come true. In London, the Band will be performing in concerts for hundreds of children from Hasmonean Girls School, Yavneh College, Kisharon, JCoss and a special community performance at Norrice Lea Synagogue. Their message is all about inclusion and believing in yourself and your abilities.